The potato is one of May’s Vegetables of the Month. One of the most versatile veggies we are likely to find in the family pantry. 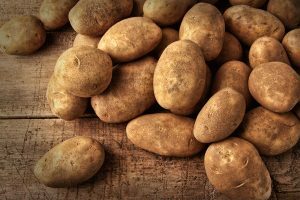 Potatoes can be prepared almost every way we cook food including boiling, baking, sautéing, roasting, grilling, and steaming. They are a staple in many Arizonans diet because they go so well with almost every protein, other vegetables, and pretty much everything we use to fill our plates. This month, try some new recipes for this old family favorite. Here are just some of the delicious ways you can use potatoes when you plan your May menu. This entry was posted in Recipes, Vegetables and tagged bacon, Casserole, Cook, French fries, Fruit and Vegetable, Home, Mashed potato, Roasting. Bookmark the permalink.